OUR MISSION The Mission of Safehope is to provide advocacy and support to all survivors and secondary victims of domestic and sexual violence and stalking; while seeking social change through awareness, education, and prevention. From 24-hour Help Line to supportive services to professional training, we offer crisis intervention, advocacy, and support; to address the needs of victims and their children. 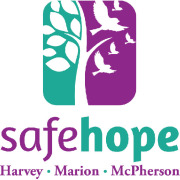 Safehope, based in Newton, KS, provides advocacy and support to all survivors, and secondary victims of domestic and sexual violence, and stalking in Harvey, Marion, and McPherson counties. Safehope creates a safe environment for survivors to understand the resources and options available to them and get support as they begin to heal from the trauma. Our services are available 24-hours a day, seven days a week. We serve those who are survivor/victims of domestic violence and sexual assault and stalking at no charge. Services meet the needs not only of victims seeking emergency shelter but also for outreach victims and their families in our rural service area for crucial outreach services.